The Best 15 Free Things to Do in Illinois! Money isn’t always required to have an enjoyable experience in Illinois. Many free events and activities are held throughout the state each year. Whether you’re an adventure-seeker or music lover, there’s plenty of memories to be made without having to spend a dime. Several museums across Chicago offer free admission, and there’s never any fee to explore the many state parks around the state. The following free destinations are family-friendly and worth the visit. The Chicago Jazz Festival is a free music festival held downtown Chicago in Millennium Park each Labor Day weekend. Local, national, and international jazz musicians are featured, drawing in thousands of visitors from across the country. This Chicago tradition showcases the vast and diverse jazz talent to anyone who appreciates jazz. The Smart Art Museum is part of the University of Chicago and home to thought-provoking exhibitions. This museum is free to the public and features an extensive collection of modern masterpieces, contemporary art, Chinese ritual art, and Renaissance paintings. Garden of the Gods in the Shawnee National Forest is the perfect free getaway for nature-lovers. You can see how the elements have sculpted incredible rock formations over thousands of years. Free activities include hiking, picnicking, and camping to name a few. The Scarecrow Festival is a free event held each October in St. Charles. This Illinois family tradition has been boasting hundreds of scarecrows for 30 years. Live entertainment plus an arts and crafts show, petting zoo, carnival, and other free activities are provided. The Chicago Cultural Center is one of the most popular free attractions in Chicago. Dozens of free events including live music and films are held in this architectural wonder each year. The building itself is an incredible landmark featuring two stained-glass domes. Millennium Park in Chicago is one of the most popular parks in Chicago. 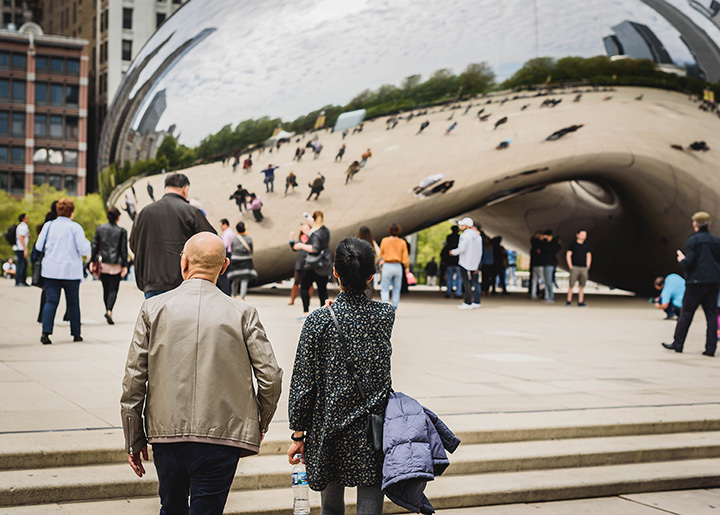 Located downtown Chicago on Michigan Avenue, this tourist hotspot in the site of free cultural events such as live orchestra performances and concern. Millennium Park also features numerous art exhibitions, beautiful urban gardens, stunning architecture, and even ice skating (during winter months). The DeKalb Corn Fest is one of the few free summer music festivals left in Illinois. It’s a pretty big ordeal and features tournaments, contests, live music, bus tours, art, carnival rides, cars, and lots of corn. Kids and adults alike gather in DeKalb to celebrate the summer at this free festival. Located in the Lincoln Park neighborhood of Chicago, the Lincoln Park Zoo is a family favorite spot with many activities throughout the year. This free zoo offers several animal habitats, hundreds of animal species, and daily activities such as cow feeding and polar bear training. The zoo puts on a winter wonderland of lights during the ZooLights, which is also free and features musical light shows, crafts, holiday snacks, live ice-sculpting, train rides, and more. With over 13 miles of hiking trails, Starved Rock State Park is another wonder of nature without any admission fee. The park itself was formed by glaciers and how features steep rock walls, dark valleys, and cascading waterfalls. Hiking, boating, picnicking, biking, and exploration of the park are always free. The Maggie Daley Skating Ribbon is an outdoor skating trail open to the public during the winter months. This free skating ribbon winds around the park, emulating a winter trail through the mountains. Visitors can skate through the park and take in stunning views of the Chicago skyline. Visitors can explore the ancient worlds at The Oriental Institute Museum in Chicago’s Southside. This free museum showcases permanent and rotating galleries featuring excavated objects from ancient civilizations including Mesopotamia, Egypt, and Persia. Giant City State Park is an outdoor wonderland with no admission fee. Nature lovers can explore the many hiking trails and huge sandstone bluffs while marveling at the lush ferns and many flower species. This free park is also home to over 75 varieties of massive trees. As one of the top tourist destinations in the state, Navy Pier is a free family attraction with rich history. This not-for-profit attraction features parks, gardens, shops, regular events, and stunning views of Lake Michigan and the Chicago skyline. Beautiful firework shows are also held at Navy Pier each July, as well. A celebration of the golden years is held downtown Springfield each year at the Route 66 Mother Road Festival. This free event features classic cars, music, food, and plenty of conversations about the good ‘ol days with locals. Wintertime in the Chicago suburbs means Christmas light shows. The Festival of Lights in Aurora is a free drive-through light show featuring hundreds of displays. It’s typically held from Nov. 25 through Dec. 25 each year.